Rainbow Riches, along with Starburst, is the most popular and most recognisable slot game in the online casino world. With a great bonus round and huge jackpots to win, this is a great game for newbies and veterans alike. 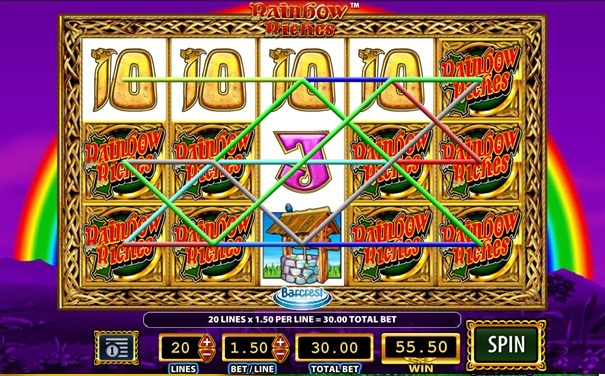 Rainbow Riches offers you the pub fruit machine feel all while sitting on your couch at home. 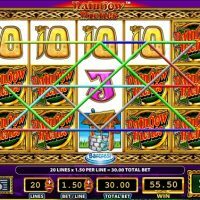 This classic slot game, developed in 2010, has risen to become almost the undisputed slot favourite on the internet with its great bonuses, it’s regular wins and big jackpots. 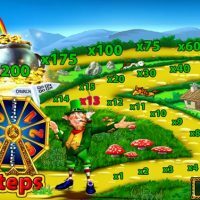 There are certainly bigger jackpots out there, but a potential of £/€100,000 is pretty tasty, and with the wins coming in quite consistently, it means you’re unlikely to get into a hole chasing that elusive pot of gold. There are nine different symbols to look out for, of which four are bonus symbols which help you to increase your winnings. 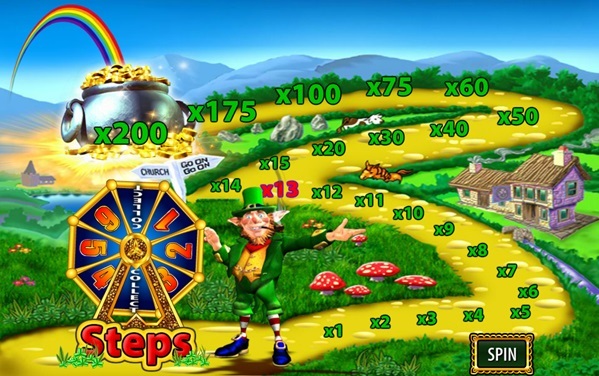 By hitting three or more of the ‘Road to Riches’ symbols takes you to the pot of gold bonus where your winnings multiply by x2 all the way up to x200 by spinning the wheel. By hitting three or more of the ‘Wishing Well’ symbols, you turn the pots around, and the pot your pointer lands on gives you a grand prize of between x50 and x500. 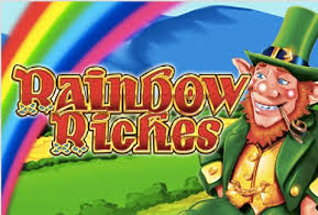 The Rainbow Riches theme is all built around the ‘Luck of the Irish’ from its pot of gold symbols and bonus round, to the joyful Leprechaun assisting you in taking the money from the bottom of the rainbow. There’s only a few symbols and only five lines which makes this slot game really straightforward and easy to get the hang of. 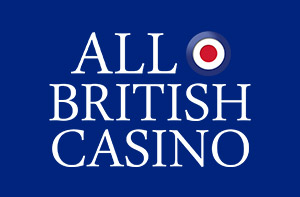 You can bet from £/€0.01 to a £/€400 per spin, which is as wide a parameter as anything you’d find anywhere in the online casino world, and perfect for any player – those with tight budgets, and those without. 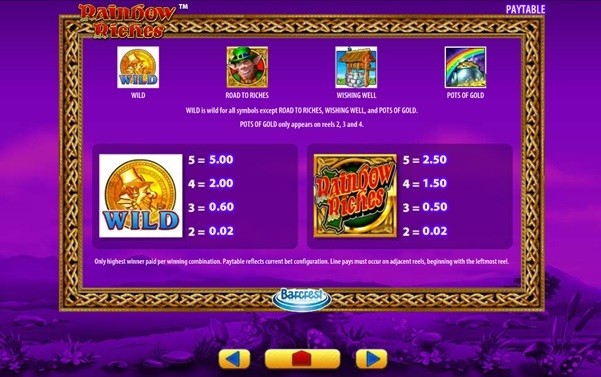 There is no autoplay mode on Rainbow Riches, which is unusual for a slot game in this day and age, but for those users who like to keep a track on their winnings after every spin, this isn’t a bad thing. Rainbow Riches is a legendary slot in the casino industry and is often used by casinos when they want to give away free spins to customers. 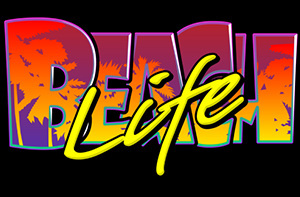 The reason for that is people love to play the game thanks to its fun graphics and pub fruit machine feel. 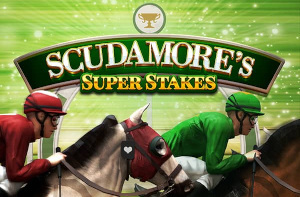 It may not be the biggest paying slot out there, but what it lacks in big jackpots, it makes up for in some fantastic bonus rounds that will have you on the edge of your seat. Perhaps part of its appeal is the pure simplicity of the game. That makes it a great choice for newbies, while more experienced players will appreciate that the game doesn’t take itself too seriously and so you’ll always enjoy having a few spins of the reels.